St. Loman’s Mullingar travelled south to Kilbeggan last Sunday morning to fulfil this re-fixed 4th Round league against Kilbeggan Shamrocks. Prior to this match Shamrocks were unbeaten in Division 3. So Loman’s were very aware that they had to significantly improve from their recent disappointing Round 3 performance against Multyfarnham. All of the Blues starting 15 played very well throughout, as did replacement Sean Daly. The experienced St. Loman’s custodian Stephen Gallagher replaced Dano Fitzsimons in goals this week, Oisin Hogan played a solid game throughout (he was the only defender who played in the previous week’s game). The full backline of Tyrrell, Carroll and Kelly played very well too with Sean Kelly being particularly impressive for the Mullingar side. The healthy return of 3 goals and 15 points came from no less than 8 individual scorers. Defenders Christy Gilbert and Seanie Lancaster contributed a combined total of 4 points, the inside full forward line of Cox and Hickey shared 14 points between themselves, with the remaining scores coming from Gallagher, Kavanagh, McCartan and Reilly. Stephen Ryan caused lots of problems for the Kilbeggan halfback line, whilst Tristan Graham was also very effective at number 15. Indeed it was excellent work from young Graham that led to a St. Loman’s penalty which Hickey calmly dispatched into the back of the net. As previously mentioned, all players played well throughout, however if Sean Kelly was the stand-out player in the backs then Frank Kavanagh was the stand-out player up front, Frank is definitely a player to watch for in the future. Manager Adrian Charles was unavailable this weekend and Luke Dempsey deputised for him, it’s fair to say that Luke, along with selectors Declan Cox & Gary Devine were pleased with the team’s solid performance throughout. St. Loman’s Mullingar will now travel to Pairc Chiarian (Athlone) next week for Round 5 of the league. 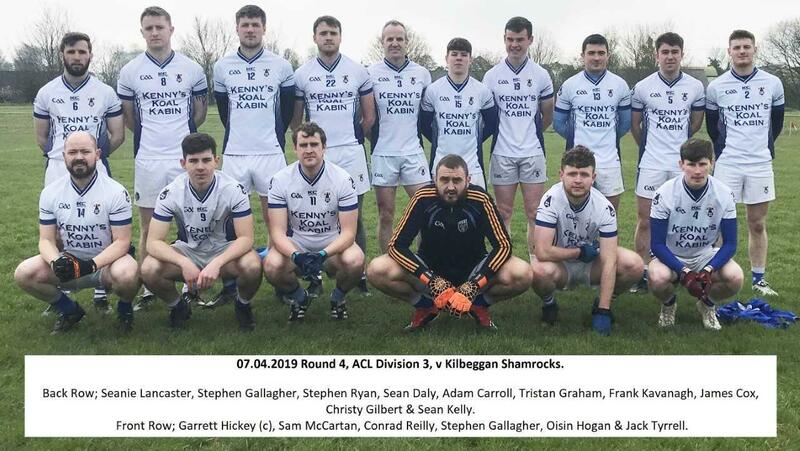 Team; Stephen Gallagher, Sean Kelly, Adam Carroll, Jack Tyrrell, Oisin Hogan, Christy Gilbert (0-3), Sean Lancaster (0-1), Stephen Gallagher (0-1), Sam McCartan (0-2), Frank Kavanagh (0-2), Conrad Reilly (0-1), Stephen Ryan, James Cox (2-1), Garrett Hickey (1-4) & Tristan Graham. Sub used; Sean Daly. We are having a merchandise day with KC sports in Lakepoint Park on Saturday 13th April from 11am-1pm. A Full range of size samples will be available on the day. KC staff will be on site on the day to assist with sizing and take your order. Full payment is required on the day / Receipt will be issued / Cheques or card payments not accepted. KC will return with completed order at agreed date in 4-5 weeks. Any queries please contact Paul Dempsey (085 8030067). Congratulations to Westmeath GAA on picking up their second piece of silverware this season with a 1.13 to 0.13 point victory over Laois. A special mention to our three representatives on the panel John Heslin, Ronan O’Toole and Sean Flanagan. Two of whom got on the scoresheet with O’Toole scoring two points and Heslin contributing a point of his own. A marvellous achievement, well done lads!